The most important way to build a relationship with your Compassion child is by writing letters. Through letters, you and your child learn about each other's lives, families and how you can pray for each other. Do my letters really matter? Children feel a greater sense of joy, love, encouragement and belonging. They feel more motivated at school and church activities. They consistently demonstrate greater confidence. Letters are kept forever, regularly reading them, particularly when they are discouraged. How do letters get to my Compassion child? You write a letter with the supplied correspondence paper, paper of your own or using the online letter writing tools available in My Compassion. 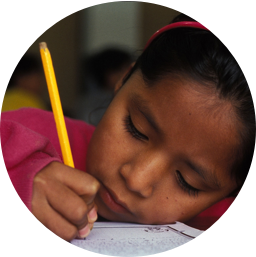 When we receive your hand-written letter, we scan it and send this image along with letters written online to Compassion’s office in your child’s country for translation. 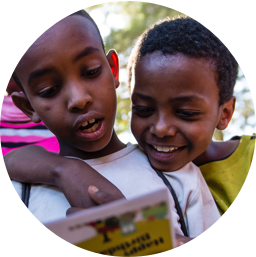 Once it’s translated, our team in the field office confirms the translation, prints a copy of your letter and delivers it to your child’s Compassion centre. That’s all there is to it. From the time you write your letter, it can be in your Compassion child’s hands in as little as three to four weeks! Your letters are also available in My Compassion so you can refresh your memory when it’s time to write again. If letters are sent electronically, can I receive paper letters instead? Definitely! As a Compassion supporter, you will receive printed copies of your letters in the mail, as well as have access to them in your My Compassion account. You can also choose to only receive your letters digitally, which will help reduce our printing and mailing costs. To change your mailing preferences, login to my.compassion.ca or call us at 1-800-563-5437. Can I send stickers and other paper gifts? Absolutely! Stickers and other paper gifts will still be sent to your child. However, these items could take as long as two months to arrive in your child’s country. I don’t know what to write. Do you have any advice? Sure do! Think simple: tell your child about your daily life, what your hobbies are, what you do for work. Help them get to know you a little better, and ask them about their life, too. You can also send them a favourite Bible verse or tell them what the Lord has been teaching you. Encourage them in their schoolwork and let them know that you are praying for them. (Read an example letter here to get some ideas.) We’ve also put together a list of 80 helpful letter-writing ideas which will give you tons to write about! Sign up for My Compassion! 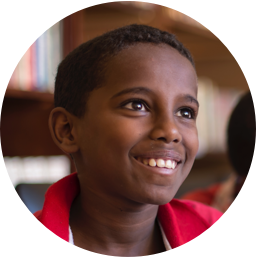 My Compassion contains lots of helpful information about your sponsored child, their family and what their daily life and community are like, giving you a strong starting point for your letters. 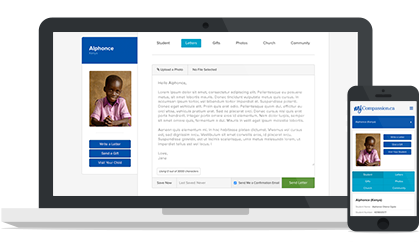 Login to your account to write to your sponsored child! PLEASE NOTE: The online letter-writing tool has moved to My Compassion to ensure a more secure, and better experience for writing to your child. Sign up or login to your My Compassion account to send a card, poster, colouring page, bookmark, or letter today!